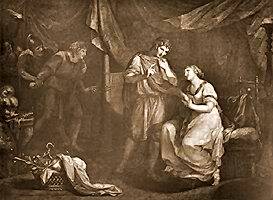 DIOMEDES AND CRESSIDA. TROILUS, ULYSSES, AND THERSITES, AT A DISTANCE. Cres. Nay, but you part in anger. Tro. Doth that grieve thee? O wither'd truth! Ulyss. Why, how now, lord? Tro. By Jove, I will be patient. Dio. Pho, Pho! adieu; you palter. Cres. In faith, I do not; come hither once again. Ulyss. You shake, my lord, at something; will you go? Tro. She strokes his cheek! Painted by Angelica Kauffman, R. A. Engraved by Luigi Schiavonetti.